Pets Costs > How Much Does a Tiger Cub Cost? How Much Does a Tiger Cub Cost? Tigers are known to be large, strong animals that have the ability to take down a five hundred pound animal with ease. Known as the largest member of the cat family, these big cats can be kept as pets as long as the owner is properly licensed and registered with their local city and/or state. 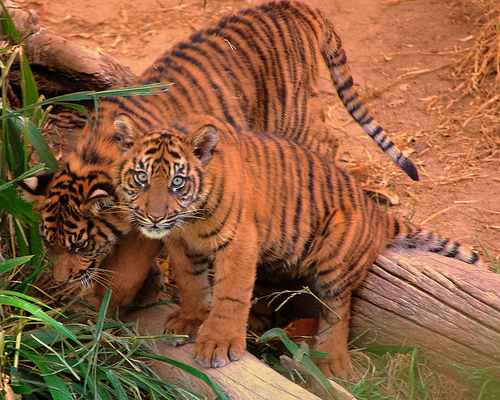 On average, a tiger cub can cost anywhere from $800 to as much as $3,000. This cost will depend on the age, gender, quality and the breeder you adopt from. The rarer the cat is, the higher the cost will be. This price, of course, won’t include the annual maintenance costs Owners should plan on spending upwards of $20,000+ in their first year alone, and we explain what you should budget for in our “extra costs” section below. Note that you should always check with your local city and state laws to make sure it is legal to house one. AdTob.com, an online classified website, had a handful of listings at the time of writing this guide. From what we saw, the average tiger cub, commonly the white tiger cub, was listed for $900 to $2,500. Mercabba, a similar classified ad-based website, has multiple listings as well, with prices ranging from $500 to $1,100. This Big Cat Rescue article says the average tiger cub can cost $2,500 and offers the additional costs that go along with adopting one. Just about all of your tiger cubs on the market will be raised from birth, will be tamed, come with a health guarantee, up-to-date vaccinations and should be checked by a reputable vet. Some can even be potty trained. Unlike a domesticated house cat, a tiger will be much different due to their temperaments and aggression such as urine markings. A tiger’s diet main, at least in the wild, will be consist of deer, wild pigs, antelope and water buffalo. The amount it eats will depend on the exact species, but on average, plan on feeding a tiger 10 to 15 pounds of meat per day. Owners also need to factor in supplements and vitamins to ensure the tiger is getting all the essential nutrients to maintain a healthy lifestyle while in captivation. Exoticanimalsforsale.net says most of your commercially prepared meat designed for an exotic animal will be primarily horse meat, but research has shown this meat can be deficient in nutrients, preventing an exotic animal, such as a tiger, from gaining the nutrients it needs every day to survive. The food and vitamins alone will cost close to $2,000 per year. Naturally, a tiger will need an area to use their brains to play with things, catch things and even jump and explore. For this reason, a tiger will need a very larger and natural habitat, similar to the miles of land they explore every day. Comparable to what you see at a zoo, a tiger will need more than just a patch of grass to play in. They will need a water area, toys, trees, a strong shelter and areas to jump around. The area should also be fenced in accordingly to prevent an escape. Habitats alone can cost well into the thousands. A good setup could get close to the six figure range. Since it’s going to be very hard to find a tiger cub locally, you will need to factor in shipping fees, which can cost upwards of $500+. This cost will all depend on the distance being traveled and how the tiger is being shipped. Permits, which you will need to house a tiger, will be an additional cost, and the cost will greatly depend on where you live. Some states may only offer permits to those who run a zoo, whereas others may only offer permits to those who meet certain requirements such as having a certain amount of land, being a certain distance from another house, etc. Most states, from what we researched, will want to inspect your property before offering a certification, and most will also want you to take a big cat handling course to become certified/licensed. As with any pet, a tiger will require routine vet visits and could encounter unexpected problems. Since very few vets will work with an exotic animal of this size, you may be finding yourself in a bind if no one is able to come to your location. Regardless, a vet visit can cost hundreds, if not thousands if you have to transport your cub miles away for an emergency surgery. If you don’t have a van, for instance, to transport your tiger, this could be $15,000+ alone for a used version. Liability insurance will be a must if you want to house a tiger cub. Depending on your record, this insurance policy can be anywhere from as little as $1,000 to more than $15,000 per year. Keep in mind that most homeowners’ insurance policies will cancel your policy if they were to find you housed an exotic animal on your premises. The Big Cat Rescue says, all wild cats, regardless if they are spayed or neutered, will spray bucket loads of urine on everything they want to claim as their own. Due to their natural instints, this is how nature taught them how to guard their territory. The rescue claims there’s no way to prevent this from happening, regardless of what a breeder tells you. i was so excited to get this tiger cub!! but i kept on getting emails saying that the shipping was delayed, or there was an unexpected fee. I ordered my tiger cub 4 months ago and still havent recieved it. i havent heard anything for 2 months… dont buy from this guy!! !